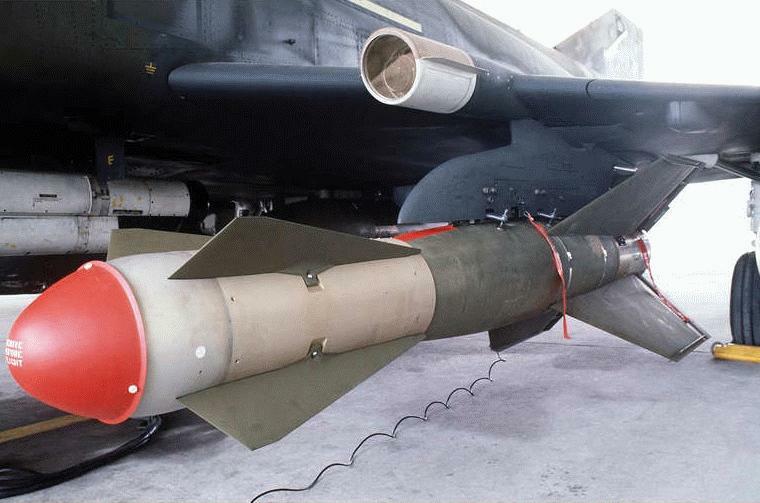 The GBU-15 bomb is an unpowered, glide weapon used to destroy high value enemy targets. It is designed to be used with F-15E and F-111F aircraft. 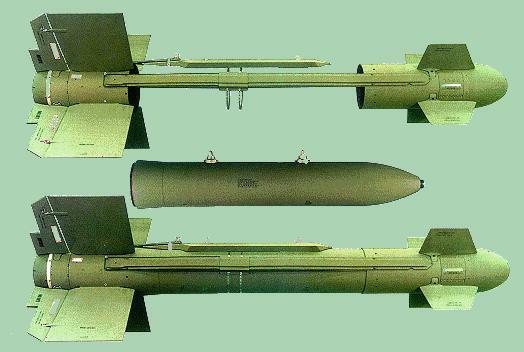 The GBU-15 provides the capability for accurate (automatic or manual) guided delivery of a MK-84 bomb at increased ranges. The GBU-15's effective standoff range is greater than that of laser-guided munitions, since the GBU-15 does not need to have acquired the target before it is released. The weapon is remotely controlled by a datalink system, and the weapon systems opera- tor locates the target area and the specific aimpoint by observing the video transmitted from the weapon. The weapon's midcourse flight path can be adjusted either automatically or manually. Weapon video is either electro-optical (TV camera) or infrared, and generated in the nose of the weapon. 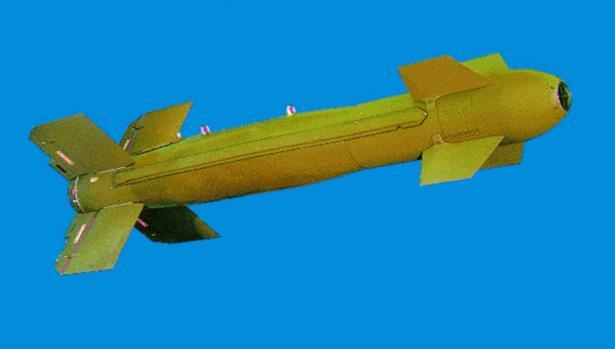 The weapon consists of consisting of various interchangeable guidance, fusing, and control systems designed to meet specific mission requirements, that are attached to either an MK-84 or BLU-109 penetrating warhead. Each weapon has five components -- a forward guidance section, warhead adapter section, control module, airfoil components and a weapon data link. The guidance section is attached to the nose of the weapon and contains either a television guidance system for daytime or an imaging infrared system for night or limited, adverse weather operations. 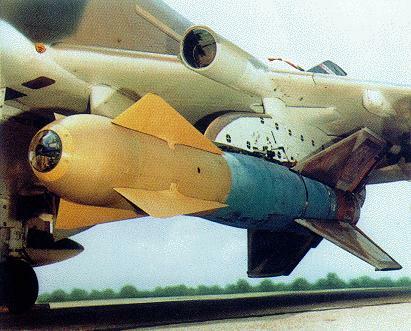 A data link in the tail section sends guidance updates to the control aircraft that enables the weapon systems operator to guide the bomb by remote control to its target. An external electrical conduit extends the length of the warhead which attaches the guidance adapter and control unit. The conduit carries electrical signals between the guidance and control sections. The umbilical receptacle passes guidance and control data between cockpit control systems of the launching aircraft and the weapon prior to launch. The rear control section consists of four wings are in an "X"-like arrangement with trailing edge flap control surfaces for flight maneuvering. The control module contains the autopilot, which collects steering data from the guidance section and converts the information into signals that move the wing control surfaces to change the weapon's flight path. 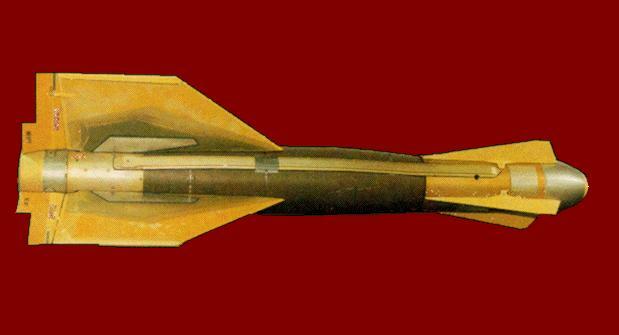 The GBU-15 may be used in direct or indirect attack. In a direct attack, the pilot selects a target before launch, locks the weapon guidance system onto it and launches the weapon. The weapon automatically guides itself to the target, enabling the pilot to leave the area. In an indirect attack, the weapon is guided by remote control after launch. The pilot releases the weapon and, via remote control, searches for the target. Once the target is acquired, the weapon can be locked to the target or manually guided via the date-link system. This highly maneuverable weapon has a low-to-medium altitude delivery capability with high accuracy. It also has a standoff capability. 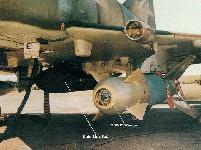 During Desert Storm, all 71 GBU-15 modular glide bombs used were dropped from F-111F aircraft. Most notably, GBU-15s were the munitions used for destroying the oil manifolds on the storage tanks to stop oil from spilling into the Gulf. 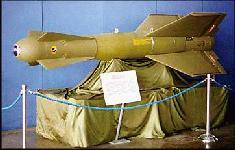 These GBU-15s sealed flaming oil pipeline manifolds sabotaged by Saddam Hussein's troops. The Air Force Development Test Center, Eglin Air Force Base, Fla., began developing the GBU-15 in 1974. 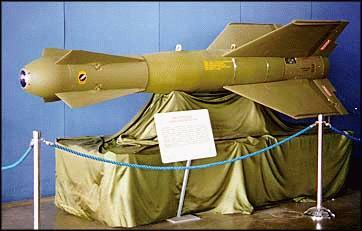 It was a product improvement of the early guided bombs used during the Southeast Asia conflict. 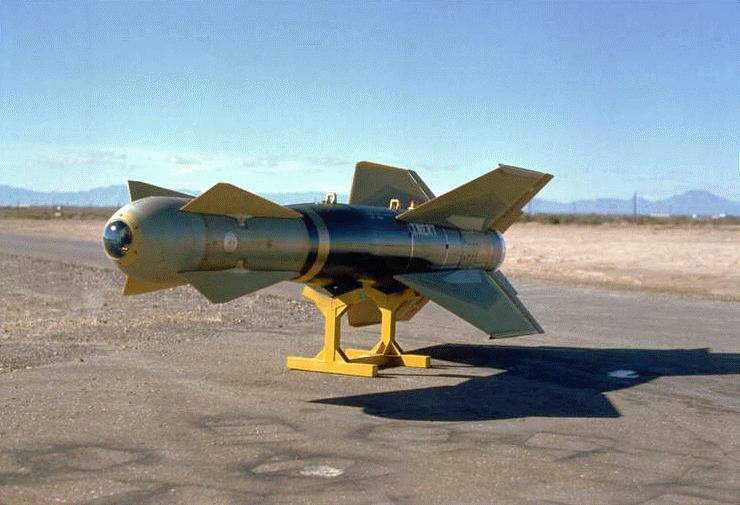 Flight testing of the weapon began in 1975. 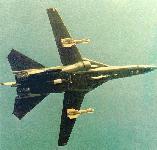 The GBU-15 with television guidance, completed full-scale operational test and evaluation in November 1983. In February 1985, initial operational test and evaluation was completed on the imaging infrared guidance seeker. In December 1987, the program management responsibility for the GBU-15 weapon system transferred from the Air Force Systems Command to the Air Force Logistics Command. The commands merged to become the Air Force Materiel Command in 1992. The Inertial Terrain-Aided Guidance (ITAG) system is an adverse weather, precision guidance system for the GBU-15. It replaces the guidance system for this weapon. ITAG is an inertial navigator who uses updates from a radar altimeter correlated with terrain elevation maps. GPS is used to initialize the inertial navigator prior to weapon release. ITAG, being developed by Sandia National Laboratory, will give Joint Force Commanders the capability to accurately deliver weapons against NBC targets during a wide range of adverse weather conditions. The ITAG kit "straps on" to 2000-pound class conventional bombs to make a precision-guided weapon, and it will make it possible to plan attacks to take advantage of local weather conditions which may be favorable to minimizing the dispersal of released NBC agents. The ITAG uses GPS-initialized inertial navigation which is augmented by a terrain-reading, all-weather, high-altitude, precision radar altimeter. The real-time onboard navigation computer correlates radar altimeter data with previously acquired digitized, three-dimensional synthetic aperture radar terrain maps stored on board the weapon. 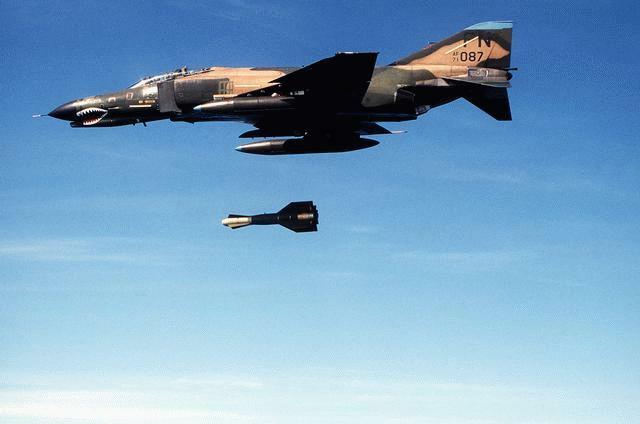 Unlike current laser-guided bombs which can only be employed in clear air-mass conditions, the ITAG will be able to achieve 3-meter circular error probable (CEP) accuracy in adverse weather. On 23 April 1999, the Chief of Staff of the Air Force gave direction to provide the GBU-15 air-to-surface weapon with Global Positioning System, or GPS, guidance giving it an all-weather capability. In early May 1999 contracts were signed with Applied Sciences Engineering International of Niceville FL and Raytheon Defense Systems of Tucson AZ. The two contractors� concepts are different but proven and compatible with the F-15E. The total quick reaction program including these two contracts and all government costs total $7 million for the first phase of additional GPS guidance to the GBU-15. An unreleased quantity of the enhanced weapon were delivered to combat units by 01 July 1999. During the second phase, the best concepts of both contractors will be adopted. They will then work as a team to upgrade an additional 1,200 to 1,500 GBU-15s, which is expected to cost approximately $50 million. Primary Function: Air-to-surface guided glide bomb. GBU-15 gets all-weather capability Leading Edge SEPTEMBER 1999 -- The Precision Strike Systems Program Office has been tasked to equip the GBU-15 air-to-surface weapon with Global Positioning System, or GPS, guidance giving it an all-weather capability. 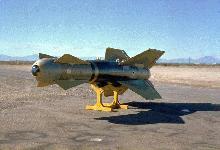 Enhanced GBU completes first Phase II drop test, Air Force Print News, 31 August 2000 -- The Enhanced Guided Bomb Unit-15 weapon successfully completed its first Phase II program weapon drop test with precision accuracy here recently.